Dr. Ronald George Cavell was born on October 15, 1938, and passed away on November 25, 2017. Ron graduated from McGill University with a BSc (Honours) degree in Chemistry in 1958, then completed master’s (1960) and PhD (1962) degrees at UBC and studied as a NATO Postdoctoral Fellow at Cambridge University, receiving a PhD in 1964. He joined the Department of Chemistry at the University of Alberta in 1964, became full professor in 1974, and was made Emeritus Professor in 2004. Awarded fellowship in the Chemical Institute of Canada in 1975, in 1979 he received the CIC’s inaugural Alcan Lecture Award for distinguished contributions in inorganic or electrochemistry in Canada. The University of Alberta awarded him the 1993/94 McCalla Research Professorship. In 1985, Ron began working with synchrotron-generated radiation that allows scientists to see matter at a microscopic level. 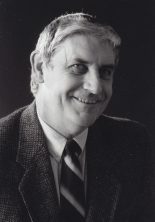 A founding member of the Canadian Institute for Synchrotron Radiation, formed to establish the Canadian Light Source (CLS) at the University of Saskatchewan, Ron was a founding member of the CLS Board of Directors and helped guide the facility from concept and design through to construction. In recognition of those efforts, he received the Saskatchewan government’s prestigious Saskatchewan Distinguished Service Award in March 2009. Passionate about his work, when he passed away, Ron was in the midst of setting up a scholarship to foster research excellence in chemistry. If desired, donations can be made in his honour to the Ronald George Cavell Graduate Scholarship in Physical or Inorganic Chemistry, through memorial.support.ubc.ca/ronald-cavell.